There is a school fundraiser this weekend, a Fiesta no less, and guess who signed up to head decorations?Â It will be parents only, read, margaritas, so everyone will be able to chat it up without anyone pulling on their appendages. The words public school fundraiser = no budget.Â Can I make the place look fun, yet tasteful, for $150?Â Yes, $150 for a party hosting hundreds.Â Challenge accepted! 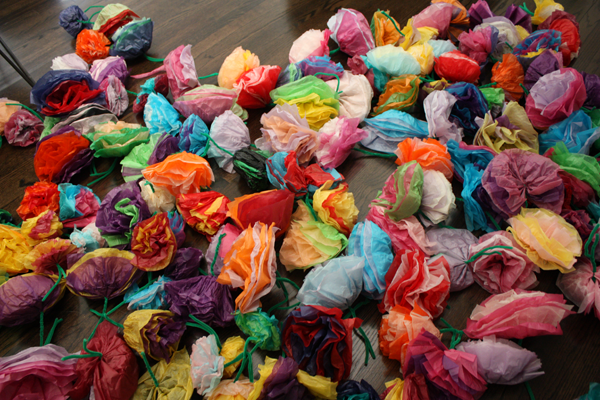 Our awesome Spanish teacher had the kids make tissue flowers to help out and I was delivered 2 big garbage bags full. 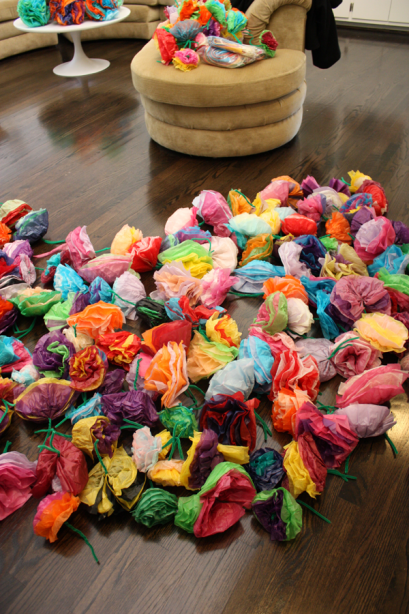 Now to make it work for our event…hmmmm…..
That’s a LOT of little flowers.Â I had no idea what I was going to get, so now that it’s all here…how do I make it work?Â I decided to group them by color to make pom-poms that I can hang with invisible fishing line from the tent beams. 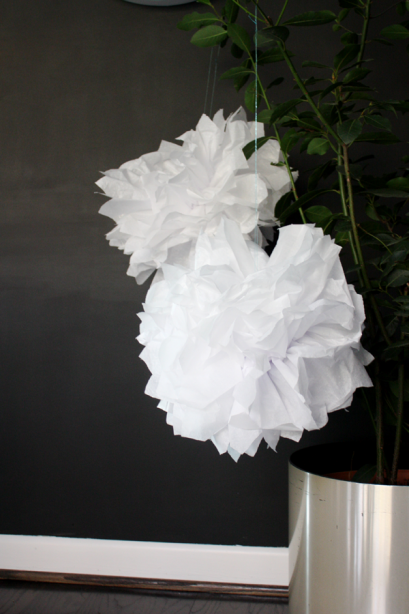 I think I like these.Â This is only about a third of what I finally ended up with…..I will intersperse them with these white ones below I’ve been making at home….the simple tissue Peony everyone always makes…a classic, and so easy and inexpensive.Â Tutorial here. 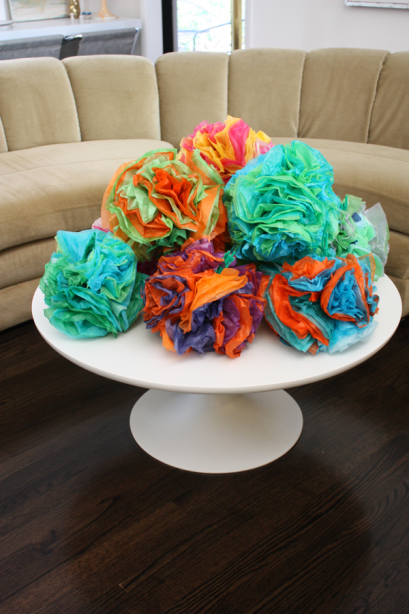 Now, how am I going to cover 62 tables for under $150?Â The cheapest linen rental was going to be $850, so that’s out.Â BTW, what a racket!Â You can buy them from a restaurant supply for the same cost as some of the rental rates….I’m missing a business opportunity for sure. So this is what I think we can afford, that will look nice…. 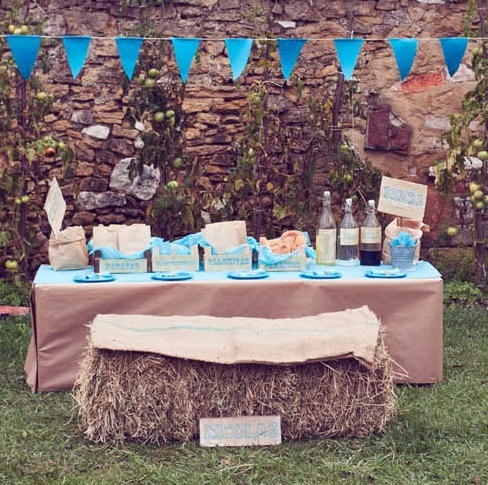 Photo via escarabajos bichos & mariposas, which is a seriously cute party post. Wish me luck, I’m a wee bit nervous about how it will all look, but I’ll remain optimistic that we can pull it off. 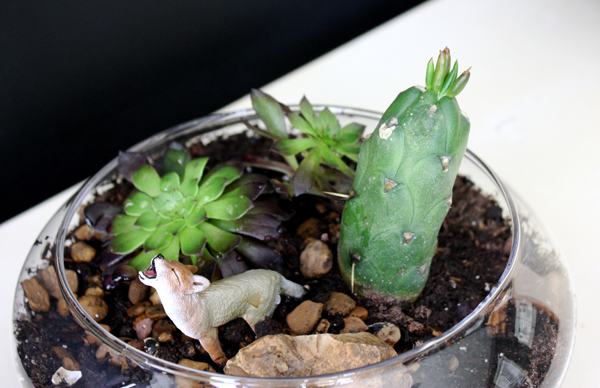 I’ll try and take snaps when it’s all set up…. Previous Previous post: Posts in…Ugh.